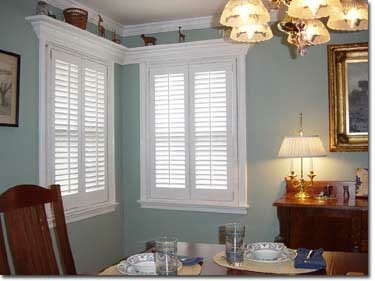 As timeless as they are beautiful, interior wood shutters are a classic window treatment. We manufacture both paneled and louvered shutters in a number of styles to suit your taste. Our Interior line is made of quality, hand selected, furniture grade Basswood. This even grained wood is carefully crafted, ready for stain or paint to match your home's color palette. Designed to last, we use only solid brass eyelets to attach the control bar to our operable louvers. These solid wood louver blades pivot on large, 3/8" diameter tenons that are part of the louver slat. The louver tenons are offset to balance the weight of the control bar so when you select the perfect angle, the blades will faithfully hold position. The shutter frames are created with traditional mortise and tenon construction and are precisely milled to exacting tolerances on our computer-controlled equipment. These frame components are assembled with weather-proof glue, clamped under pressure, and fixed with mahogany dowels. This blend of modern craftsmanship and traditional construction makes our shutters strong, durable, and lasting. Our beautiful, wooden, interior shutters aren't just for windows. They can be used for refacing and updating kitchen cabinets or pantry doors, or to conceal a laundry. interior louvered shutters make wonderful closet doors and our interior panels can be used as wainscot. Another relative of the window shutter is the multi-paneled privacy screen. This attractive, wooden, interior divider can provide a tasteful break in the look of a room and when needed, can be folded and easily moved.